Television of the 1970s was filled with familiar faces, recognizable actors who made the rounds in sitcoms, dramas, and movies-of-the-week. They may not have been household names at the time (or ever), but you knew them when you saw them. Producer Norman Lear took this one step further. If you watch his iconic ‘70s sitcoms like All In The Family, Sanford And Son, and Good Times — weeknights on getTV, of course — you’ll notice many of the same faces popping up a lot. Often, they’re reliable performers Lear called upon time and time again to play different characters, sometimes different characters on the same program. And sometimes they’re a performer with star potential who Lear tested out with an eye toward the future. Beginning with All In The Family in 1971 — which remains the TV sitcom with the most spin-offs — Lear hired supporting actors with potential and gave them their shot. Sometimes they got their own show right away, like Bea Arthur with Maude. Sometimes it took a little longer, like when Sherman Hemsley, Isabel Sanford and Mike Evans spun off into The Jeffersons. And in a few notable cases, an actor appeared in a small role on one show before starring on another. In a sense, Lear used the Hollywood system of the 1930s and ‘40s — where each studio had a stable of actors — as a model. He (and his casting team) created an unofficial stock company of talented performers and kept hiring them again and again. And, in a few notable cases, he gave actors other opportunities to be creative. By our math, there are at least 50 recognizable actors who appeared in more than one role in what we’ll call “The Lear-verse.” Here’s are ten standouts who did double (or triple, or more) duty. Burt Mustin, elderly Mr. Quigley on All In The Family (3 roles, 2 shows); Kim Hamilton, the original Helen Willis on All in the Family (6 roles, 5 shows); Helen Martin, “Weeping Wanda” on Good Times (6 roles, 3 shows); Mel Stewart, Henry Jefferson on All In The Family (3 roles, 3 shows); Thalmus Rasulala, Florida’s handsome boss on Good Times (6 roles, 4 shows); Roscoe Lee Browne, Archie’s hospital roommate on All In The Family (5 roles, 4 shows); Robert Mandan, the auctioneer in the Sanford And Son pilot (5 roles, 3 shows); and Robert Guillaume, the doctor who sees Archie when he breaks a chain letter (4 roles, 4 shows). 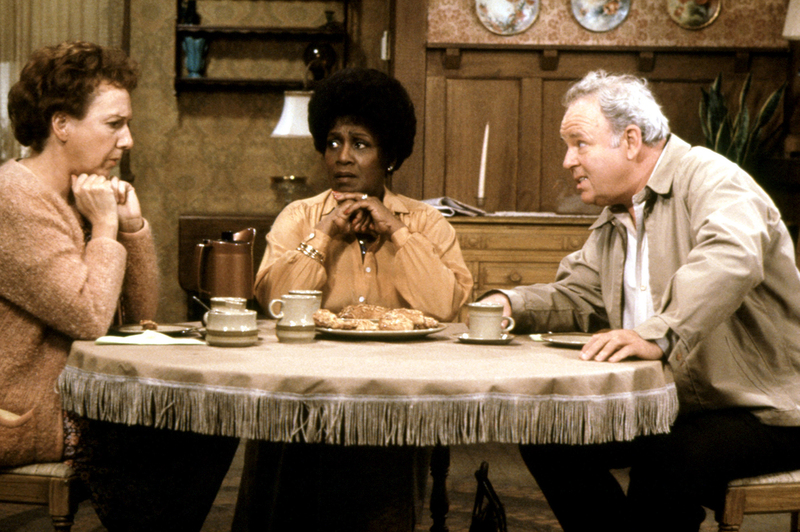 Watch All In The Family at 7p ET, Sanford And Son at 10p ET, and Good Times at 12a ET on getTV. For more, visit the getTV schedule.